It’s been quite a while since I last updated! That’s not to say that it’s been quiet in the world of trans politics – quite the opposite, in fact. 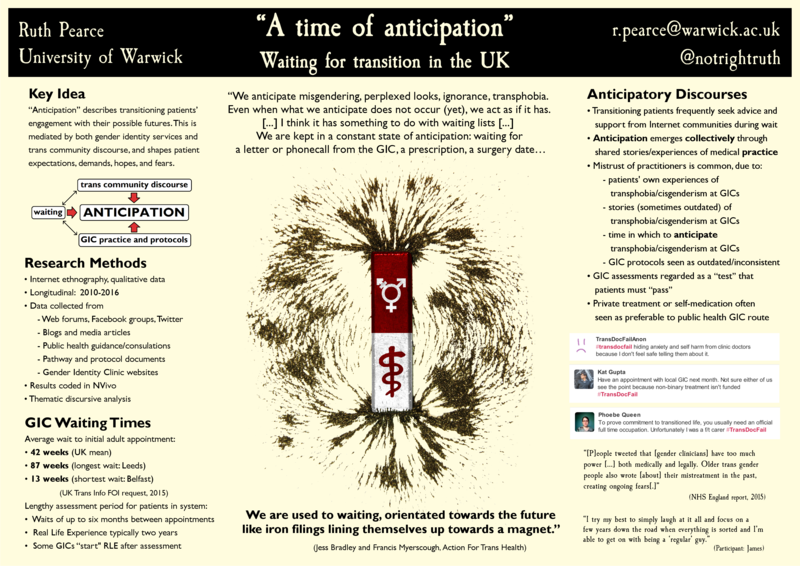 In the UK alone we’ve seen #transdocfail, the furore over cissexism/transphobia from Suzanne Moore and Julie Burchill, the tragic death of Lucy Meadows, the publication of various interesting reports and the creation of various worthy campaigns…in the last few months we’ve seen pain, misery and hope. I’d like to be writing about all of this. But, as always, the update schedule on this blog is less about what I necessarily think is interesting/important, and more about what I have the time and/or motivation to write about. In recent months I’ve been very busy, and I think I’m likely to remain busy for some time to come. Much of my energy has been focussed on my PhD research, which looks at discourses of trans health. You can read about there here. I’ve also been busy with playing music in bands (particularly Not Right) and organising academic events (including Spotlight on: Genderqueer and the Emergence of Trans seminar series). I suspect there will be a time when I update this blog more regularly once again. Until then, feel free to keep checking back – I’ll be here occasionally!